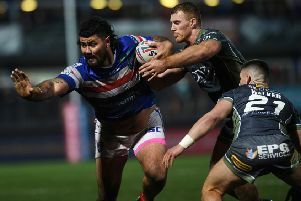 THE REAL test of Wakefield Trinity Wildcats’ professionalism comes now, half-back Liam Finn reckons. Trinity will face visitors Warrington Wolves for the second time in 15 days tomorrow, following their 56-12 Ladbrokes Challenge Cup semi-final drubbing. That was the middle of three successive defeats for Wildcats, who also lost 46-20 at home to Castleford Tigers in their final Super League game and were crushed 60-12 at Wigan Warriors in the opening round of the First Utility Super-8s. Wakefield are well adrift of the top-four and already safe from relegation, but Finn said they can’t afford to put their cue on the rack after a year of real progress. Wakefield have confounded the pundits by qualifying for the Super-8s, but Finn said a poor final seven games would take some of the gloss of their year. “We would much rather be where we are now than where we were last year,” he said. “But sport is a week-to-week thing and at this moment in time it is pretty tough and we are struggling. It doesn’t get easy just because we are in the Super-8s and the club is secure for next year. That doesn’t make a loss feel any easier, it is still difficult to take. “We have got to look for improvements this week and show some character. We want to take positives into next season. We want to progress from this year and we don’t want to take a step backwards, which [last Friday] probably was. “We have been happy with the way we have dug in when it has been tough. “That has won us a couple of games we probably shouldn’t have won. Our attitude was disappointing last week, but if you have got it between the ears you can fix that. James Batchelor, who played for England academy against Australia in Sydney a week ago, is included in Trinity’s initial 19-man squad. Ben Jones-Bishop, Jon Molloy and Bill Tupou could return after injury, but Anthony Tupou has joined the casualty list and Frazer Morris also drops out. Wakefield Trinity Wildcats: from Arona, Arundel, Batchelor, Crowther, Fifita, Finn, Hall, Jones-Bishop, Jowitt, Lyne, Mazive, Miller, Molloy, Moore, Scruton, Sio, B Tupou, Walton, Yates. Warrington Wolves: from Atkins, Clark, Currie, Dwyer, B Evans, R Evanss, Gidley, Hill, Hughes, G King, T King, Penny, Ratchford, Russell, Sandow, Sims, Westerman, Westwood, Wilde.